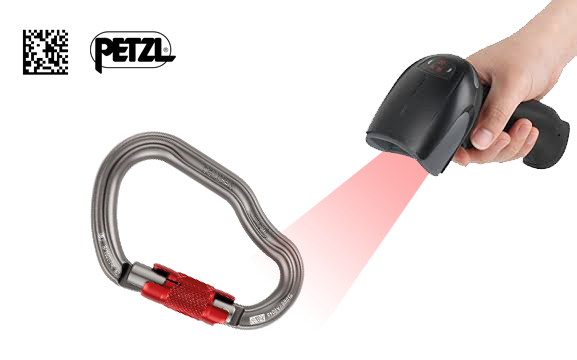 Petzl 2D (QR) Codes – Save time inspecting! You can scan the serial number straight into a cell on a spreadsheet or a database, saving you time and money without the need for expensive RFID Chips or stickers that other manufacturers charge you for, as the 2D codes are printed on every piece of PPE by Petzl. Apps like Papertrail also include the Petzl Inspection routines as per the manual forms you can find on this site. Posted in General News, Pro News, Sport News. This is an excellent idea that should save us a lot of time entering new products into our asset register and eliminating serial number entry errors. However we are unable to scan the codes on products such as the RollClip and Am’D due to the code being impressed on an uneven surface. We have tried the suggested software with a number of mobile devices and camera systems. We have also tried some expensive symbol scanners with resolutions of less than 0.2 mm. There has been some success using a magnifier lens with these scanners however as yet it has proved impossible to scan a RollClip. Is there a suggested industrial scanner and technical specification that works reliably with all Petzl codes ?